The Gigaset A540H is the upgraded replacement for the extremely popular Gigaset A510H handset. The A540H comes with a modern slimmer, sleeker design. This handset has a generous 1.8″ high contrast display and can be customised to your personal taste with a choice of background colours and ringtones. 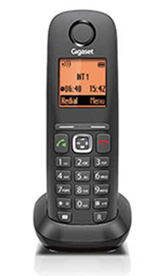 The A540H is ideal for use as a basic handset with the Gigaset N300IP and N510IP DECT base stations.